I love to entertain. If you have visited my parties tab you’ll see an array of birthday parties and showers. 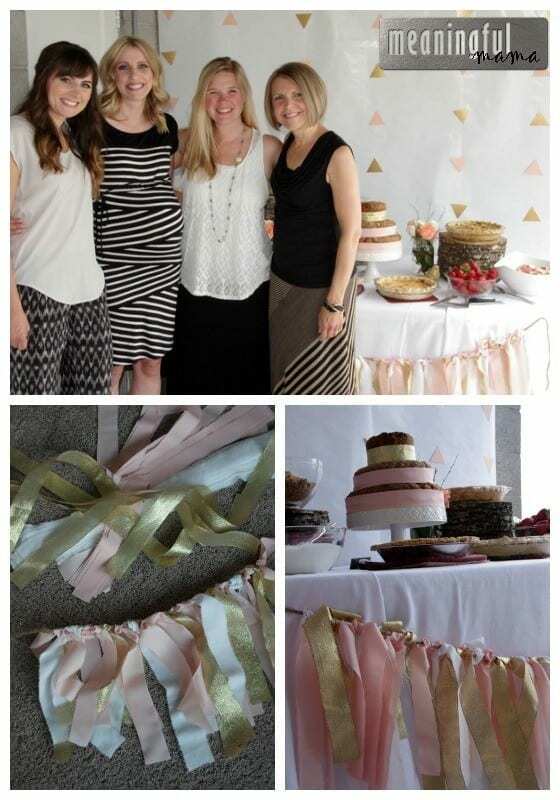 This gold and peach natural baby shower was a celebration we had for my sister-in-law. Her baby is now turning one, so this shower happened last year. It’s fun to blog about it a year after the event and look back on my niece from womb to one. She was a little life who had yet to see the light of day, and now she’s showing all her personality and the skills she has gained. We celebrated her first birthday this past weekend. We decided it would be a lot of fun to do a baby shower brunch. I hosted with my sister-in-law, Jenn, who has a great eye for design. We decided on the peach, gold and white colors, but we also wanted to incorporate natural elements and a touch of modern design. It sounds like it wouldn’t work, but we were really pleased with the outcome. The table was a mix of modern and natural. 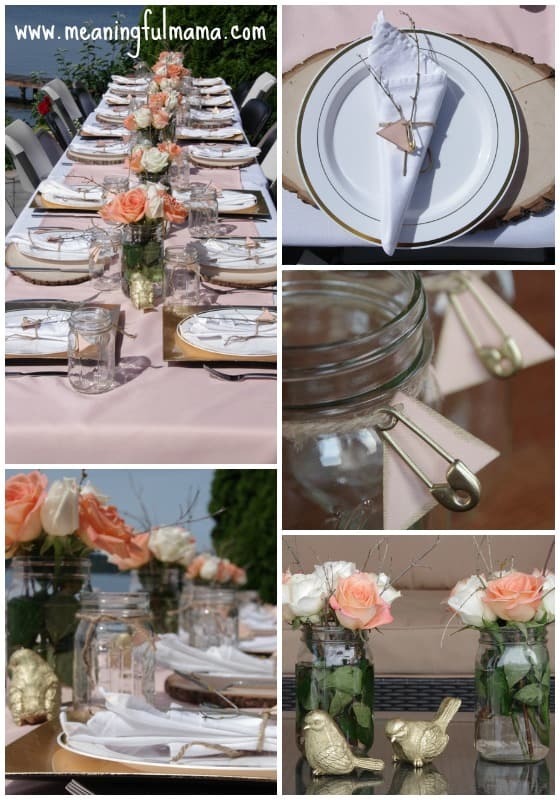 Mason jar cups were decorated with twine, spray painted gold plastic diaper pins and peach paper triangles with gold stamped around the edges. 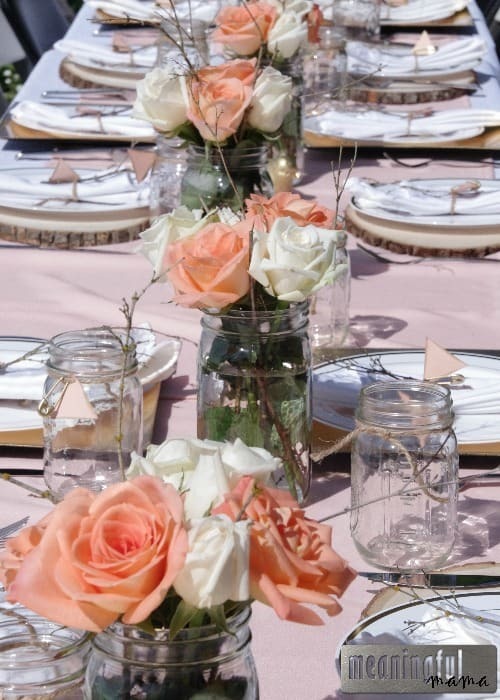 Peach and white roses with twigs sticking out decorated the center of the table. We found cheap ceramic birds at the Dollar Store that we spray painted gold. 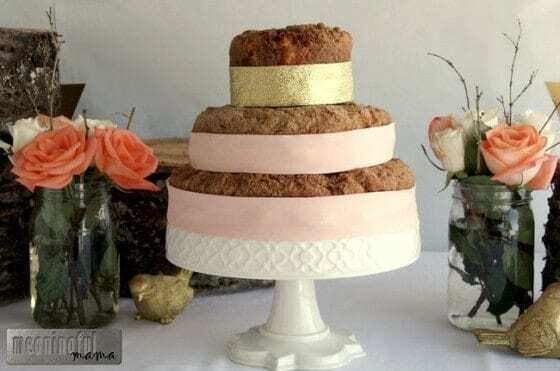 The plates were plastic and cream with a gold rim and were set on top of a combination of a modern, gold, and square chargers and a natural wood charger provided to me by the Roxy Heart Vintage. 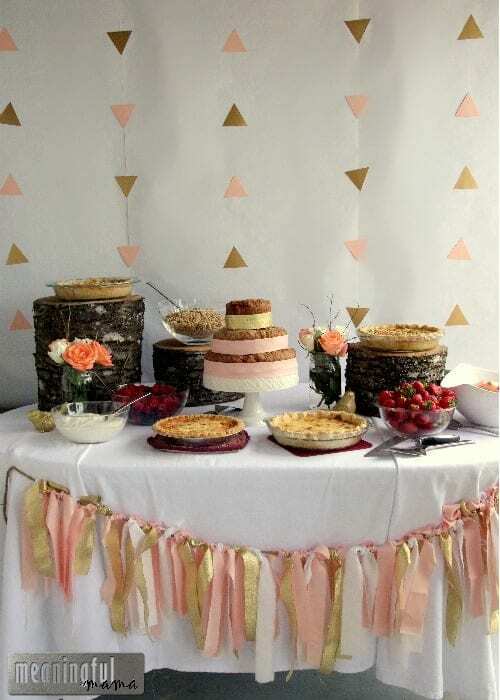 A white table cloth was covered with a homemade peach runner. I always love creating a beautiful food table to display the yummy food available. We displayed the eats on a table covered with a white table cloth. Wooden logs became stands for the food. We served a delicious bacon and swiss quiche as well as a vegetarian quiche. We also served yogurt, granola and berries for parfaits. Peaches & cream and strawberries were also on the menu. A fun component of the design was my tiered coffee cake. I do cakes as a hobby. You can check out some of my designs here. This tiered twist on a coffee cake created another element of sophistication and yet was easy to create. 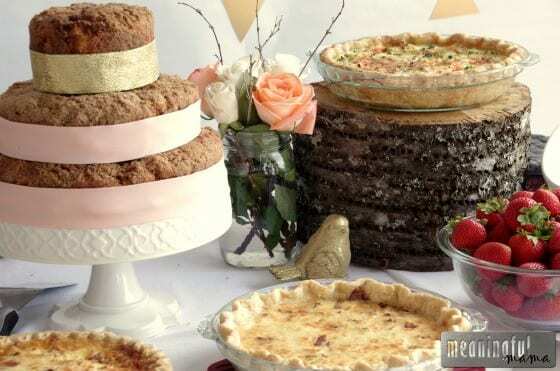 Simple bake your favorite coffee cakes in varied sizes of cake pans and stack them. I took peach fabric and a gold ribbon to wrap the tiers. The backdrop was made of white roll paper. It was that easy. We then strung peach and gold triangles on a string, which we taped to the background. We had a white table cloth and created a ribbon garland by tying strips of fabric and ribbon onto thick twine. Above you’ll see the mother-to-be, my other sister-in-law and my mother-in-law, beautiful women inside and out. It was such and honor to be able to celebrate this lovely lady and the beautiful life she was holding. Perhaps the ideas here inspire your next shower.